A wind-whipped warehouse fire on the city's east side rained embers down into a nearby neighborhood sparking several dwelling fires. 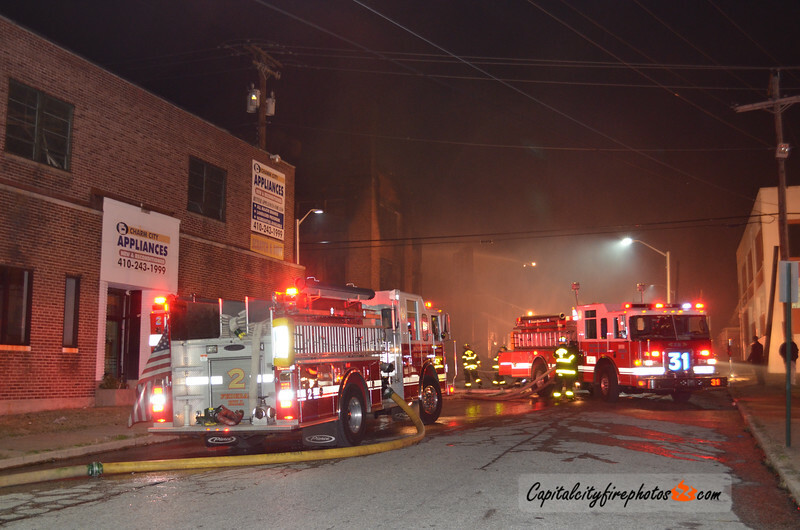 Firefighters responding to Kirk Avenue and Curtain Street for a building fire arrived with a fully involved, 4 story, vacant warehouse and quickly called for a second alarm. The side walls of the building collapsed early into the fire resulting in large embers being carried into occupied neighborhoods. Dwelling fires broke out in the 1500 block E. North Street, 1600 block E. Lanvale St, 1800 block N. Bond St, and 1700 block E. Preston Streets. On Bond Street, firefighters were hitting hot spots when they began to notice smoke and embers coming from the rear of row homes directly behind them. Upon investigating, companies found heavy fire on the second floor rear of a vacant. At least one of the dwelling fires went second alarm and multiple buildings were involved in most of the incidents. Companies from all over the city converged to the area including assistance from Baltimore, Anne Arundel, and Howard Counties who primarily covered city stations.